Today did not turn out well. 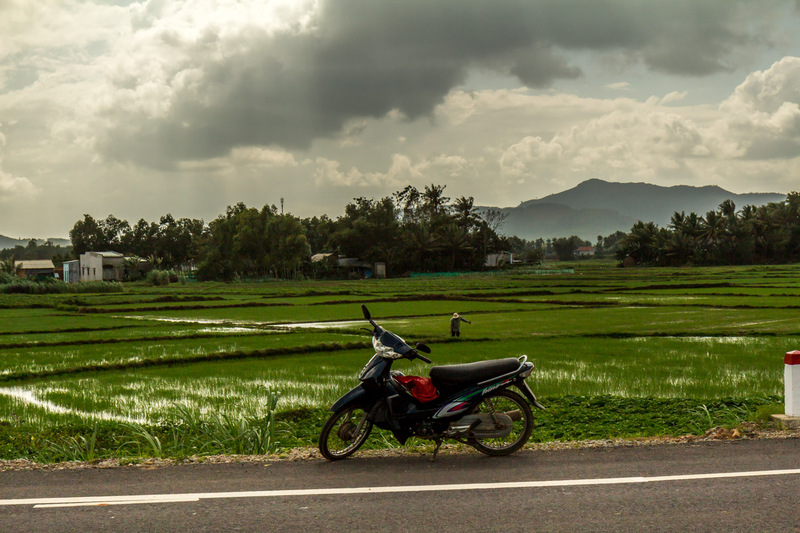 I suffered several setbacks on my ride to Hanoi. 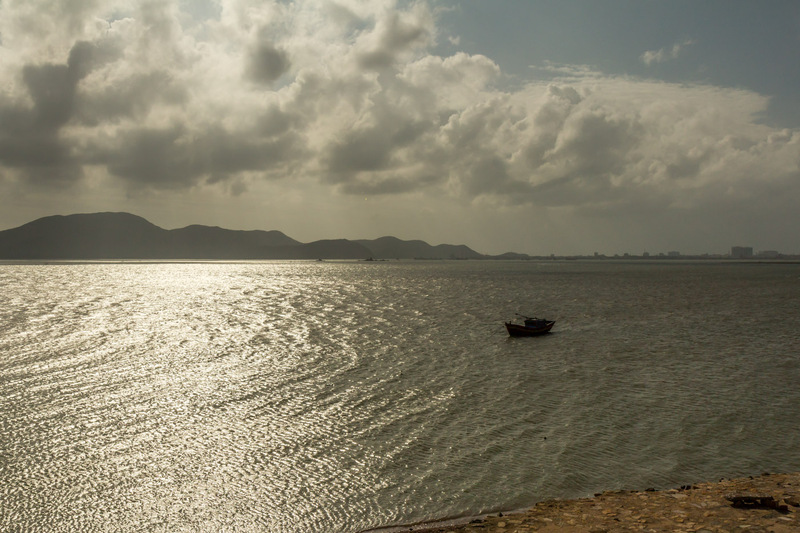 My day began early in Quy Nhon. 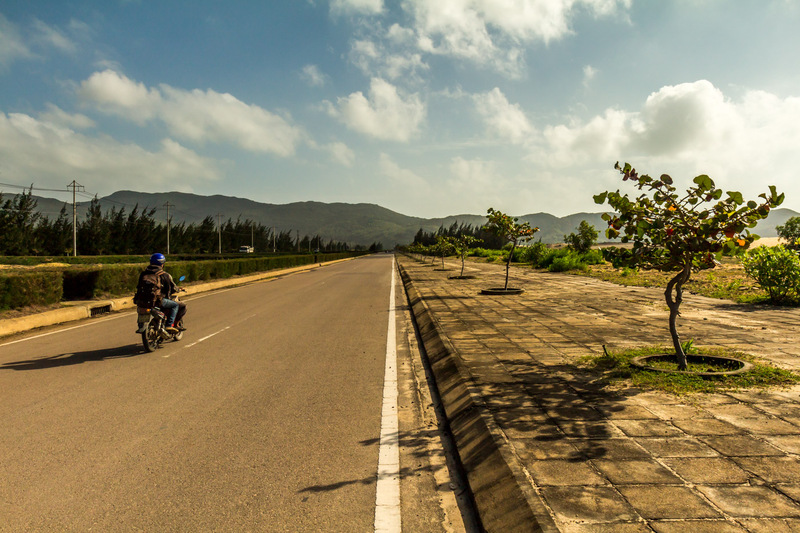 I wanted to have a lot of time on the 200 km ride to Quang Ngai. 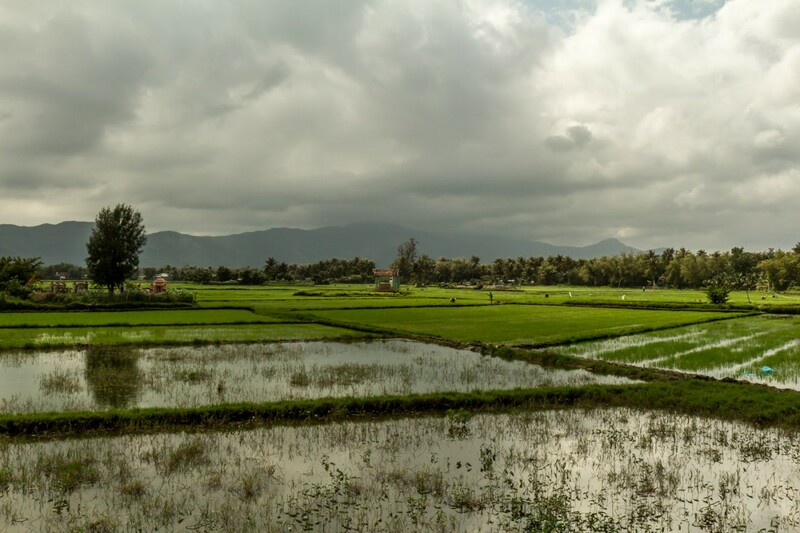 Rather than take the direct route inland to the start of the scenic portion of the Ho Chi Minh highway at Kon Tum, I had decided to spend an extra day following the coast north. 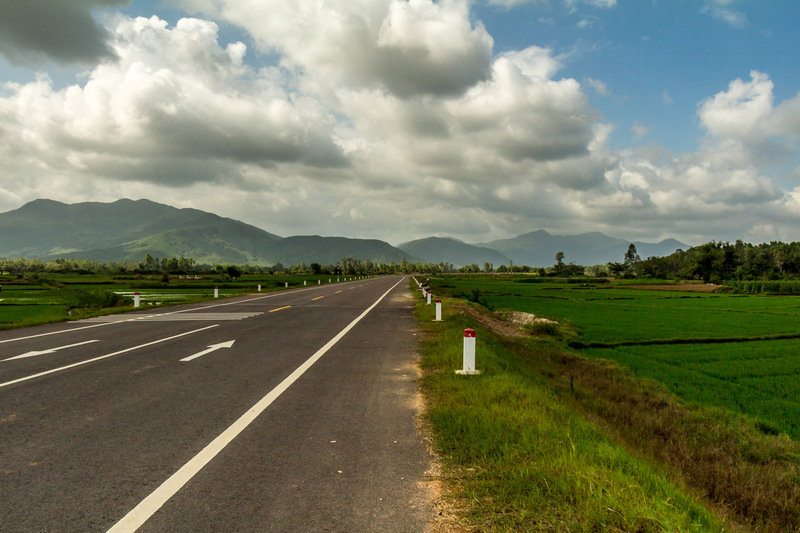 This would allow me to take the mountainous and scenic Highway 24 to Kon Tum. But first, bánh mì ốp la. 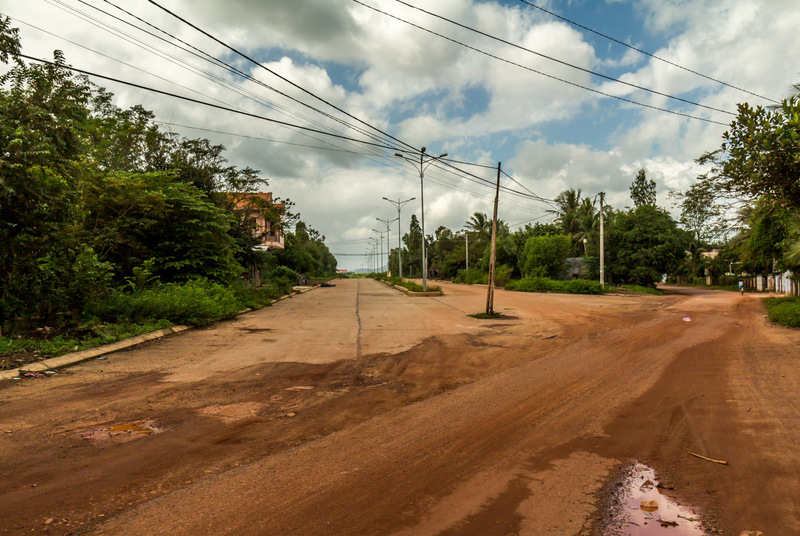 The way started out on another weird four land divided highway through sand dunes like in Mui Ne. The sidewalks were wider than the road. There were roads spurs leading straight into dunes. There were landscaped trees planted in the median and in the sidewalks. There were huge traffic circles and crosswalks. It must have cost a fortune. But there was no traffic, and nothing there besides sand dunes. 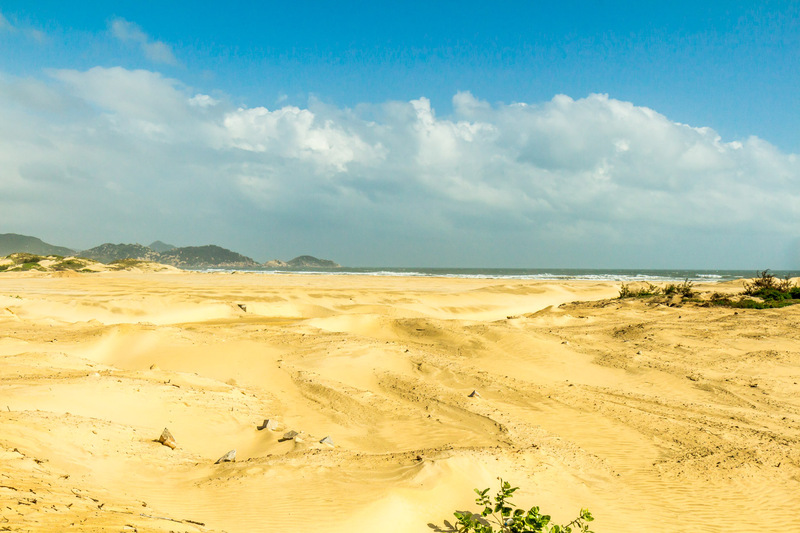 In the USA where there are dunes like that we protect them. Here they build huge roads right through them. I wonder if they want to build towns in them? Who would want to live there? I stopped to take a picture in a particularly scenic spot with a view of the ocean past the sand dunes. I didn’t use my center stand, even though my pack on the back makes Tién unstable. I made sure she was stable, walked away, and a big gust of wind blew her right over. She hit the pavement and broke off her left mirror. A lone fishing boat from the new bridge. With no easy way to see behind me, I continued. The route went through countryside, down small roads. The roads were bad, with lots of potholes, so I could only go 30 kph. But the scenery was spectacular. 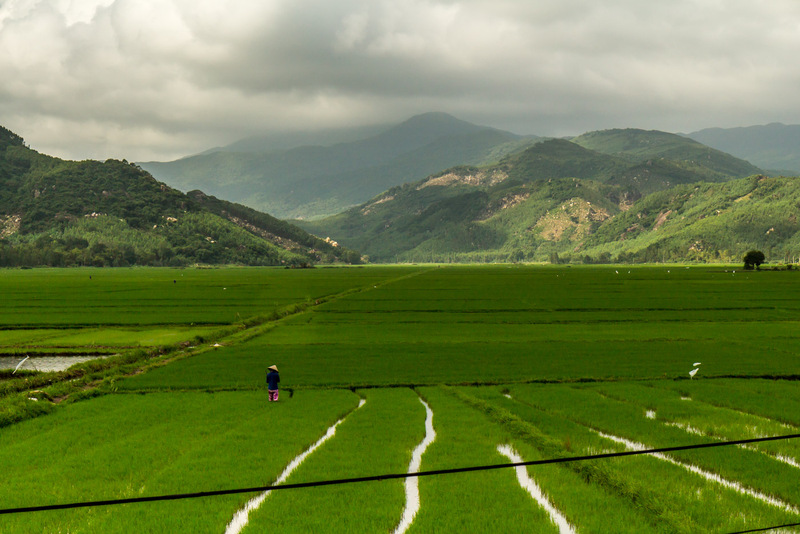 I went through villages, past green rice fields, mountains, and ponds. It was amazing. I stopped a lot for photos. But I was worried I would not make it to my destination since I had to go so slow. I missed a turn, and had to backtrack a lot. I enjoy leisurely rides in the countryside when I have a place to stay. I didn’t have a place, so I worried. Weird superhighway to nowhere through the dunes. It took me 5 hours to cover 100 km, where I rejoined AH1. 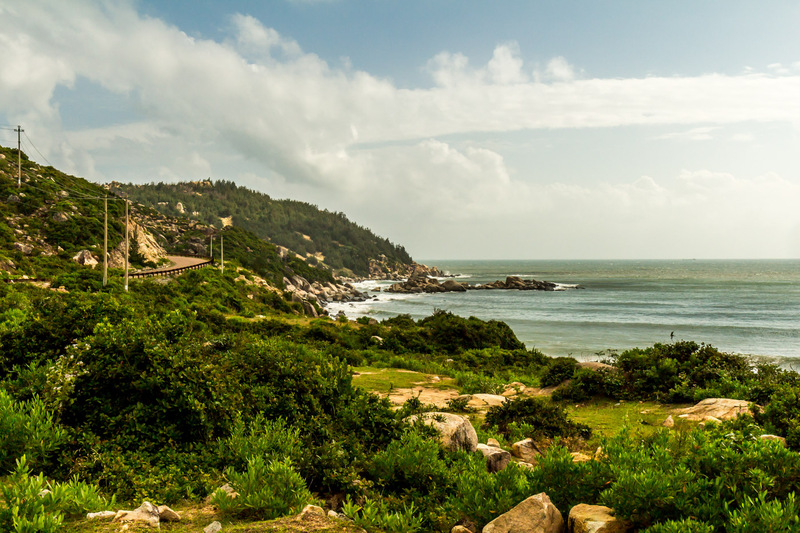 It was then I realized I forgot my passport at my guesthouse’s reception back in Quy Nhon. 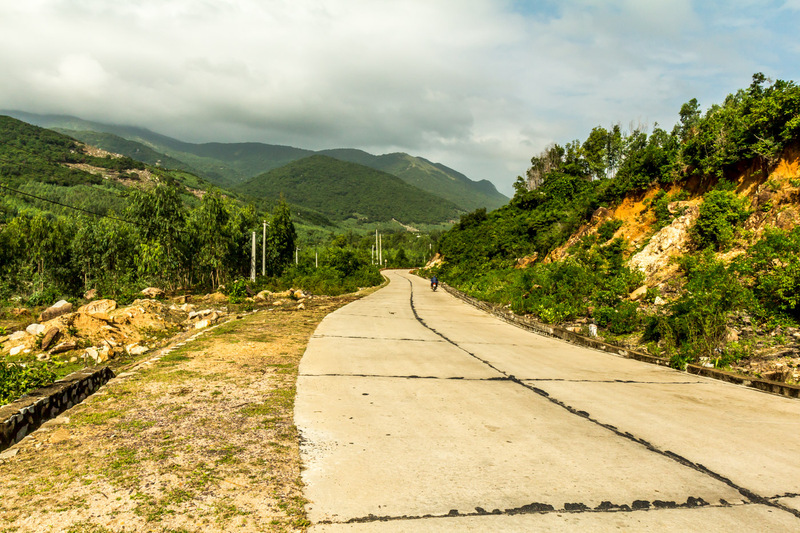 It took about 2.5 hours to ride back to Quy Nhon via AH1. I sped the whole way, which is dangerous. There will sometimes be a guy working in the middle of the road, with only a small cart right in front of him, with no reflective signs. It’s hard to see and you can crash into him easily. Back in town I got my passport back, then checked into a different guesthouse. This one was cheaper, but not as nice as the one from last night. After a full day of riding 200 km, I ended up in the same place I started this morning. Tién fell over when I took this picture. 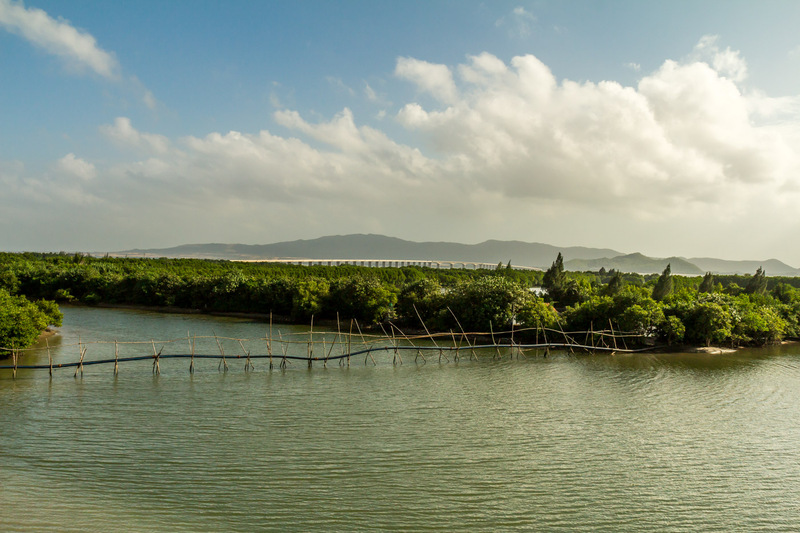 The road was scenic and followed the coast. Then went up into the mountains. It became rural, and I passed green fields. 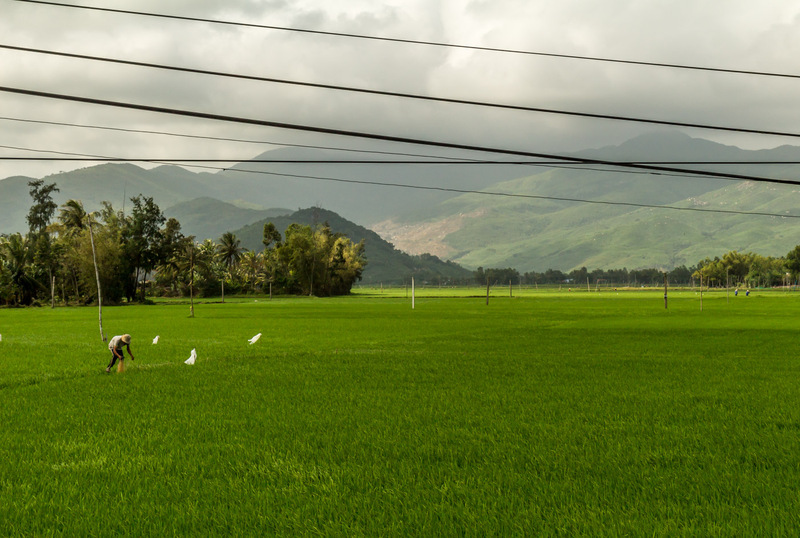 I marveled at all the green, and cursed all the power lines. 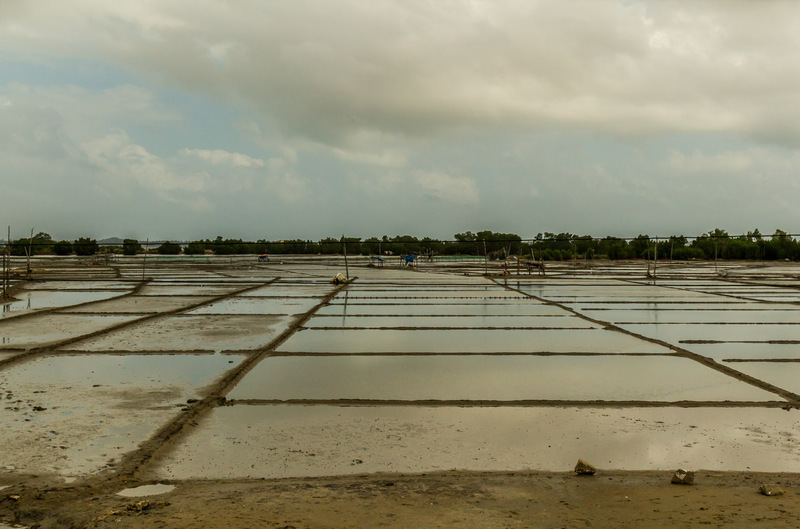 Maybe these were salt fields? The road turned to dirt, then another highway to nowhere appeared. I raced on AH1 back to where I started. Not all of it was nice and new like this stretch. Even along busy AH1, I passed farmers in their fields.